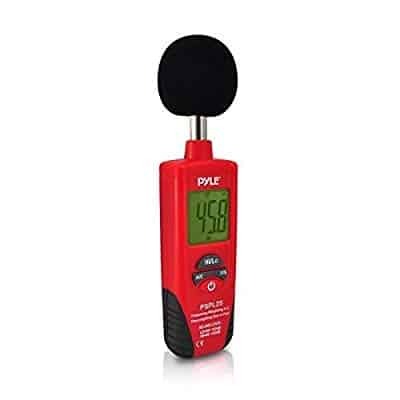 Whether you’re curious about the sound pressure level (SPL) of your hifi system or musical instruments, or you’re interested in measuring environmental noises, an SPL meter is the tool to look into. It can not only give you a sense of disturbance that you or others might make but also allow you to isolate certain peak impact noises. Who can use an SPL meter? – Almost anyone. If you’re constantly annoyed with the neighbors, if you’re not sure about the office environment, if you operate a bar that has to comply with noise ordinance at night, if you operate or use a recording studio, if you live next to an airport, and countless other examples, you have a use for an SPL meter. 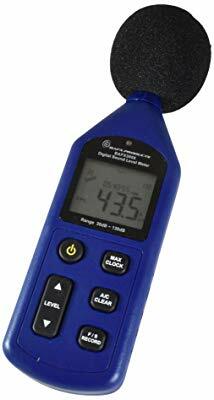 This is a medium-range SPL meter that does accurate readings between 40 to 130dB. This is pretty much the entire range of SPL that you will come across on a day to day basis. The accuracy is within 2dB plus or minus, and this digital SPL meter displays down to 0.1dB resolution. The digital display is basic and highly intuitive. Another cool feature is the built-in memory that allows you to record minimum and maximum noise levels over time. This gadget doesn’t feature a calibrator. The factory calibration seems accurate to me. I’m a music buff with a good idea of SPL ranges for nearly every sound that I come across, ahem! If you’re interested in taking advanced readings and creating charts, this SPL meter might be the one for you. The gadget comes with its own data analysis software which is compatible with all versions of Windows. You can record and store up to 4,700 data points as well as adjust the frequency of recording. The measuring range is rather wide, between 30 and 130dB. The device also boasts an accuracy of 1.5dB which suggests a highly capable microphone for this price range. You need four AA batteries to power it up or you could use a 6V DC wall adapter if you only have to take static readings. Another cool feature is that you can take readings on both dBA and dBC scales (more on this later). Let’s clear the air now and say that “SPL meter” and “decibel meter” mean exactly the same thing. It’s like some speaker manufacturers call their speakers “sound transducers”, but they’re still speakers! A useful and also budget-friendly alternative is the Risepro HT-80A. It can measure 30 to 130dB and it’s surprisingly accurate to within 1.5dB. It comes with HOLD, MAX, and MIN features for data storage and setting recording intervals. The filter is type A, which is what you need if you’re only concerned with human sensitivity to sound pressure/noise. The frequency range of 31.5Hz to 4kHz is all you’ll ever need. The response time of 0.5 seconds makes this a fast unit. The LCD display is relatively large as well. This Class 2 SPL meter is highly accurate for commercial and professional use. It measures SPL from 35 to 130dB and the backlit LCD display is highly legible. You can use its C-weighting feature if you’re trying to optimize the speakers in your stereo system, mainly the placement of one or more subwoofers. You can also use it to monitor and isolate peak noises in different timeframes. However, you can’t upload the data to a computer and perform data analysis on the unit itself. You can of course record all the readings manually like a good scientist for analysis later. The foam windsock is a good one, as it allows you to take the device outside in almost any kind of weather and take noise measurements when you need them. This is another useful SPL meter that you can use to calibrate a home theatre system or monitor your band’s rehearsal levels. The Galaxy Audio CM130 is simple to use thanks to its one-touch interface. The frequency pickup range is 125Hz to 8kHz. Essentially, this model sacrifices low bass measurement for higher upper frequencies. 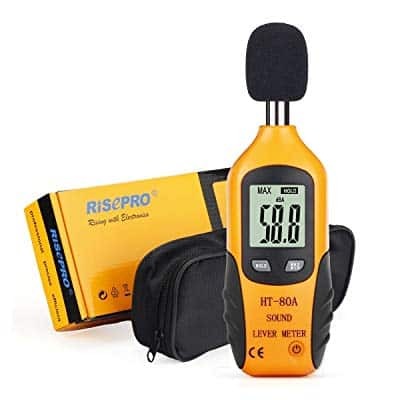 This doesn’t mean that it won’t pick up sound/noise that’s outside of that frequency range; only that the measurement won’t be accurate to its rated accuracy of +/- 2dB. All your readings will be real time and not stored. However, you can be selective and use the MAX hold function to isolate peak impact noises. You can also choose between A and C weighting which allows you to use the CM130 for multiple applications. You can use it to calibrate studio monitors due to its reliable accuracy. One of my favorite SPL meters for musicians is the Pyle PSPL25. This tiny unit features MAX hold and data hold functions as well as the standard dual weighting with type A and C filters. It has two measurement ranges: 30-100dB and 60-130dB which is pretty much standard for commercial-grade SPL meters. The accuracy is within 1.5dB but this is not backed by any class designation. The frequency range is a wide 31.5Hz to 8kHz. You’re not going to need anything more for a professional/amateur recording studio. Decibel or dB is the scientific unit for SPL, much like ampere or A is for electric current and volt or V is for electric potential. 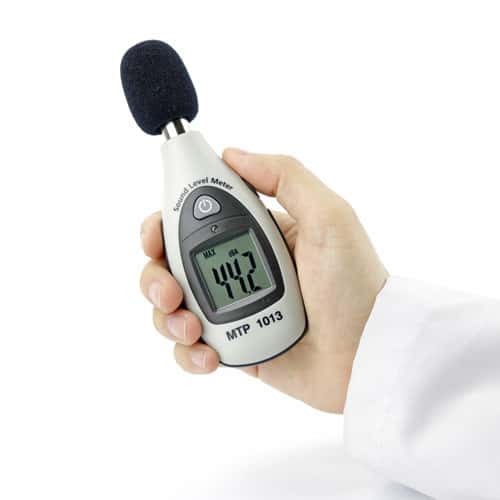 Therefore, decibel (dB) is a unit of measure used to express the level of sound pressure. It is calibrated on a logarithmic scale simply for the fact that human hearing isn’t all that great. We need large changes in sound pressures to hear any noticeable difference. For the sake of simplicity, some clever scientist figured out that you could make the human hearing scale more linear if you transform the unit to logarithmic form, and he even named the scale Bel after himself (Alexander Graham Bell, you might have heard of him). But if you were to use a bat, known for its exceptional hearing, as the basis, you might not need to transform SPL to log scale at all. Just saying. Ok, so what does your basic SPL meter do? – It takes decibel or SPL readings in real time. That may be enough for certain situations. But what if you want to monitor the sound pressure levels in a certain room over the course of a day? In that case, you need something more advanced that has data logging built-in. You can upload data to a computer and use it to create a chart as a graphical representation. Cool, right? – This may be one of the most important tools in your arsenal if you’re just building a new mixing or recording studio. Sound level charts can let you know if your location is suitable for such an installation. There are three types of frequency weightings: A, C, and Z. These filters are used in SPL meters to make calibrations and determine how exactly the sound is measured. This is important because the human ears are most sensitive to sound in the frequency range of 500Hz - 6kHz. The filters allow an SPL meter to concentrate on a certain frequency range of sound and filter out the rest (not abruptly but with a slope) to approximate human sensitivity to sound pressure. A frequency weighting is typically found on all SPL meters. This filter covers 20Hz to 20kHz, widely regarded as the human hearing range. It’s perhaps closest to how the human ear would perceive recorded noise. C weighting is the second most used filter in SPL meters. It smooths out everything to concentrate on peak sound pressure levels. High-end SPL meters are categorized under two classes or types. Class 1 and Class 2. These are the accuracy classes. Class 1 is considered the most accurate and is typically used in very sensitive situations. Class 2 SPL meters are cheaper and more common. There is however a wide range of no-designation SPL meters on the consumer market. These may have limited use but may still boast an accuracy of 1.5 to 2dB, which is more than enough most of the time. No-designation SPL meters may be good but they may require a lengthy calibration process before they can produce accurate results. Usually, manufacturers include instructions for the calibration process in the owner’s manual. Ready to Measure the Highs and Lows? Whether you just want some quick readings in order to make adjustments on the fly or you want to generate accurate charts over a long period of time, it’s up to you to decide how complex your SPL meter has to be. In my opinion, all adults should take a hearing test or two at the doctor’s office. You’ll be surprised how much your hearing sensitivities fall off beyond 8kHz or so. Bring a young son or nephew with you for the same test and you’re certain to be jealous of his much better hearing at high frequencies. 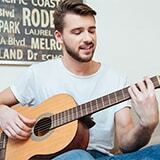 All the more reason to start taking care of your hearing starting right now!